Last year was our first year in our house, so of course Shae and I decided we needed to get a real Christmas tree. A fake tree was good enough for our little apartment the year before, but we couldn’t have a plastic tree our first year in our house. So the first weekend in December, the plastic tree stayed up in the attic and Shae and I went out to find the perfect tree for our first Christmas. Of course nothing is ever as easy as it should be, and getting our tree was no exception. The weather decided not to cooperate with us, and it was raining as we drove around looking for our tree. We found a Home Depot that had some trees, but after fighting the rain for about 45 minutes and not finding the right tree (too dry, too small, too expensive, or just too crappy) we decided to look elsewhere. Shae had done some searching online and found a couple of tree lots so we decided to try and find them (the Garmin Nuvi we got for Christmas last year would have been useful). We couldn’t find the lot we were looking for, but we found a few other lots and checked them out. Unfortunately, all of the trees were really expensive and not very nice. We were just about to give up and go back to Home Depot when we saw a sign for the lot we had been looking for. We took the next exit, took a few lucky turns, and finally found the lot. We checked out the pre-cut trees and there were quite a few nice ones, but they were still pretty expensive and we hadn’t found “the one” so we decide to check the cut-your-own lot and see what we found. It was a good decision. We grabbed a saw and checked out the trees. There were good trees everywhere, and eventually we found the one we wanted. I climbed down in the mud and went to work on the tree, and after about 30 seconds we had our tree chopped down. They shook out the needles and netted the tree for us, and we loaded the tree into our car and headed home. We were drenched and tired, but we had our tree. This year, things weren’t much easier. We knew where we were going, but of course we had two little extra degrees of difficulty. We tried to go out Friday night after work, but even though the lot is open until 9p.m., apparently the cut-your-own lot closed at dark. So Saturday we headed back over to the lot, only now it was raining (well, drizzling). I guess we just go Christmas tree shopping in the rain; that’s how we roll. We strapped on our Baby Bjorns and started searching the lot for the babies’ first tree. It took a bit of searching, but eventually we found our tree. Ella and I grabbed the saw and cut down our tree. After I carried the tree from the back of the lot all the way up to the front we had the tree shaken and netted, and then it was time to carry it out to the car and strap it to the roof. Somehow we got home without the tree flying off the roof of the car, got it inside, and got it all setup in our stand. We popped in Elf, and after a light catastrophe (or, more accurately, a light patastrophe) and a trip by Shae to Target for a new strand of lights we got to work getting the tree all decorated. Of course the babies gave us some help. Our tree looks great and we are very happy with it. Now it’s time to get some presents around it. Here are some more pics of our trip to the farm and of our tree. I decided to write this blog in response to the number one question I get asked: Is it hard? I have no idea how to answer this question, so I will tell you what a typical day is like and you can decide. I guess my morning begins around 3:30am. This is about the time when my sleep is interrupted by what sounds like a howler monkey. Most of the times its just Jack telling me to get up and make him a bottle NOW! Sometime it really is a howler monkey. This tends to wake Ella up and she comes to the realization that she too would like to be fed. I have a system where I can feed them both. Did you know that there are 4 episodes of Fresh Prince starting at 3am. There have been morning where I have actually watched all 4 episodes. If I don’t turn on the TV, I tend to fall back asleep with two babies in the bed. After they eat they are pretty easy to get back to sleep. At around 6 I like to see what happens first. Does Pat’s alarm go off, do the babies wake up, or does Lunchbox want to eat? The babies usually win. I guess this is the point where I tell you that they are pretty close to being on the same eating schedule so this makes it much easier. Most of the times they get fed about a half hour before Pat gets up so I get up and make two bottles, lay the babies next to me and Pat and stick some bottles in their mouths. Keep in mind I just watched a couple episode of Fresh Prince so I am pretty tired. Before we start, I change both babies. If I do it during the earlier feeding, they don’t go back to sleep. Anyways, this feeding is pretty interesting, for one, I tend to fall asleep and drop the bottles, When this happens, they let me know. Very loudly. They also feel the need to be wide awake and then putting them down again becomes a chore. I can usually get them back to sleep until about 9 and then we get up for the day. This is where the fun part begins. I guess you could say this is where the hard part comes in. I have to divide my time between the two babies. I always feel bad when I am playing with one and ignoring the other. While we are in the living room, I used to just lay them on one of the couch cushions, but now that they are very squirmy, I am afraid they will throw themselves off the couch. We don’t want that. So, they hang out in their car seats, bouncers, or the floor. The rest of the day we have tummy time, feedings changing, snuggling, reading them stories, talking to them, taking pictures of them, and just trying to have fun. If we decide to leave the house for the day, I have to give myself an extra hour to get ready. If we leave the house and the babies have not been fed, they will tell you about it in the middle of the store. It seems to be OK if we are in Babies R’ Us, but nowhere else. They are kind of past that point where they sleep through the stroller rides. Now they just sit there wide awake. Besides being fed, they need to be changed, I need to make sure the diaper bag is packed, make sure the stroller is in the car, and then carry everything out to the car. The one good thing about all this crap I have to carry around is that it really makes me think twice about those quick Starbucks trips. I can’t just run in and get a latte anymore. Now if I stop, I have to get the stroller out and set it up, snap Jack’s seat in, roll around to the other side of the car and snap Ella’s seat in, grab the diaper bad and hook it onto the stroller and hope there is someone around who can get the door for me. After I make my stop, I have to get the babies back in the car, take off the diaper bag, break down the stroller, put it in the back of my car and then we can finally take off. I swear a 5 minute trip to Starbucks now takes 30, but sometimes, you really, really, really need an eggnog latte. Going to a store becomes a chore. 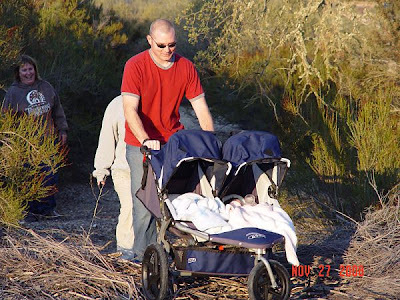 Most normal parents have these nice little strollers. Do you know what does not fit in those little strollers? Two babies. We have two strollers. The one I take with me to the stores I like to call the limo. It is very long because both car seats snap into it. The limo is very hard to steer and maneuver around all the store displays. Since I have to use both hands and all my mommy strength to push this monster stroller around, I don’t have any hands to carry things with. This past week I finally found somewhat of a solution. I got a Mommy Hook. It is a HUGE carabiner that hooks to the stroller handle. I can hook a tote bag to it and put things into the bag. I get weird looks but at least I can carry more then a few tiny items. This works most of the times, but grocery shopping is still way to hard. I just wait for Pat to get home and then go. Back on the home front, I try and feed the babies at or just before 5pm. I like having them fed and changed when Pat gets home. The last things he needs after a long day at work is to come home and fight with a screaming baby. If I can have them fed and changed, then we can spend the next hour or so just playing and loving them. This is my favorite time. We each get to hold a baby and I don’t feel guilty for leaving one in their seat. The rest of the evening is pretty mellow, we play and talk with the babies, I try and make dinner (sometimes we have to eat in shifts). We try to head to the bedroom around 10:30 or 11. We get all snuggled into bed with the babies for a feeding. Jack is pretty easy to get to sleep so Pat puts him down and drifts off. Ella is a different story! After she eats, she is just wide awake. I have to rock her for awhile before she finally gets drowsy. I put her down around 11:30 and they are both up an hour later for food. Before I know it, it is 3am again and my day starts over. So I really don’t know if my day is hard or just time consuming. Today was Jack and Ella’s two month checkup. We don’t have an easy/accurate way to weigh them so we had kind of been looking forward to the appointment so we could find out exactly how much they have grown in the past couple of months. The Cliff’s Notes version: everything is fine. For those with a little more time, here’s the recap. We got to the doctor’s office right on time and proceeded to wait for our turn to head to one of the exam rooms. I think they decided that because we had twins we should wait twice as long, but eventually we got the call. As the nurse guided us to the exam room we realized that we were heading to the same room where Jack got his junk snipped. I was hoping this visit wouldn’t be quite as bad for him, but then again it would be kind of hard to be much worse. After another round of waiting, a nurse finally came in and took the babies’ measurements. Ella weighed 11 lbs. and was 23″ tall. I guess this puts her right about average for weight and above average for height. Apparently my little girl is a tall one. I don’t think she gets her height from her mother. At the rate Ella’s going, she should pass Shae up somewhere around 3 years old. Once the nurse was all done with Ella it was Jack’s turn. Jack weighed in at a solid 11. lbs 6 oz. and was 22.5″ tall. I guess he made up for being 7 oz. lighter at birth. Of course Jack cheated a little bit by eating over 10 ounces of formula before the appointment, but he was still the winner of the weigh-off. Even though Jack was 6 ounces heavier, he is a little below average because boys are usually a little bigger. All I know is he has almost doubled in size in the past two months so he’s doing just fine. The nurse left and the doctor eventually came in and took a look at the twins. Now we are very happy with the babies’ doctor, but there was a kind of odd exchange today. He came in and looked at the babies for a second, pointed to Ella and said “That’s the girl, right? I’m not sure what it is, but something in their faces helps you tell boys and girls apart.” You know what else helps? The girl is wrapped up in a pink blanket and the boy is wrapped up in a blue one. That might be a clue too. After taking a look at the babies and their measurements he told us everything was fine and went over the vaccinations the Jack and Ella would be getting. After our longest wait yet, a nurse finally came in with a handful of needles. This was the hard part. Each of the babies got three shots and an oral vaccination. They were not happy to get their shots. It was not fun to watch them get jabbed. Poor little Jack, last time he went to the doctor he got snipped and this time he got jabbed. He’s not even old enough for a lollipop yet so he doesn’t even have that going for him. Today makes it two months since the little ones got pulled into the world and I figured it was time for another baby update. The babies don’t give me a lot of time to sit down and type, so I’m going with yet another lazy-list. I know everyone always talks about how fast the babies change, but you don’t really realize exactly how fast until you hang out with the little guys every day. They change literally overnight. (And I mean in the real form of the word “literally”, not in the “my head literally exploded” way that really means the exact opposite. It really annoys me when people use “literally” and mean “figuratively”.) Over the Thanksgiving weekend, Ella woke up one morning smiling like crazy when the night before she hadn’t even cracked a smile once. It’s pretty cool to watch their entire personalities develop and change from day-to-day. Speaking of smiling, they’re doing a lot of that lately. Ella smiles like crazy (when she isn’t crying of course), and Jack has been doing more lately too. They’re a lot more fun to interact with now. Instead of just watching them sleep, now we can actually tickle Ella’s chin and watch her smile. They’re almost like little people. Babies fart all the time, and it’s really loud. You know what else it is? Hilarious. I don’t care how old I get, farts are always funny. I laugh almost every time one of the twins rips a really loud fart when we’re sitting out on the couch. Every so often Shae and I look at each other accusingly because it’s hard to believe these little babies can make those noises. Ella popped out a minute earlier, and she seems to be trying to maintain her status as the oldest. She’s still bigger (just a little), smiled first (by about a week), and she’s starting to laugh/squeal first. I’m sure Jack will catch up. Besides, he peed in his mouth first and I don’t think Ella’s going to catch him on that one. The babies are in the middle of another growth spurt and are eating like crazy. They eat all night and all day. The other night they actually ate from the time we went to bed until we got up to feed LB at 6am. I hope they get threw this spurt pretty quick because Costco only carries so much formula. That’s about it for now. The babies go in for their two month checkup on Wednesday so we should have an update on their weights, health etc. after that. We’re all doing fine, although Shae and I could definitely use a little more rest. I’m not sure how, but we survived our first road trip with the babies. Shae, the babies, Lunchbox, and I all piled into the little Mazda Tribute and headed North to King City/Lockwood for “Baby Shower North” and Thanksgiving. Eight days, 800 miles, and 8,000 diapers later we finally got back home. The trip was a lot of fun, but travel is definitely a lot more work than it used to be. If you just want to look at pictures of our trip, here you go. The first few years I lived in San Diego, trips up to King City were pretty easy. I took off after work on Thursday night, made at most one stop (at Starbucks if they were still open and it was early enough), and generally arrived about six hours after I left. I could usually make the return trip in about 5.5 hours (less LA traffic and no stops) which wasn’t too bad. Then Shae moved down and slowed me down. She had to stop for coffee and food each way, and she usually drove part of the trip (a little slower than I drove). The trip was now about 6-6.5 hours. Once Lunchbox started tagging along, the trips took even longer. Now we had to drive the Tribute instead of the TL so we had to stop for gas in addition to the food and coffee stops, and we also had to give LB time to do his business. Now we were up to about 6.5-7 hours each way, or a full hour more than it took me without the extra baggage. This trip, however, was a different story. For starters, there was no way I was going to try to drive home Thursday night after working all day. I’m not that crazy, so Friday morning we woke up and got to work getting loaded up and on the road. I should have known what kind of day I was in for when it took us from 6-10 just to get the car loaded up. Let’s just say that 2 adults, 2 babies, 1 dog, 2 suitcases, a “Pack N Play”, 2 diaper bags, dog food, a laptop bag, a camera bag, and all sorts of miscellaneous other stuff is a Tribute load. There wasn’t any room for the monster stroller so it got strapped to the roof rack. Luckily we had a plan for the return trip, as you’ll see in an awesome photo below. Anyway, after 4 hours of packing/feeding/changing we finally got on the road around 10:30. Three feeding stops and 8 hours later we finally got into King City. Not only do we have to stop more often with the babies, but it takes forever to feed them at each stop. I never thought I’d long for the days when the trip took “only” 7 hours, but by the time we finally made it I was spent. After we eventually got to King City and got all of our crap out of (and off of) the car we got to relax for a couple of minutes before it was time for the babies to meet some grandparents. My dad and Dorothy drove down to get some extra baby time before the shower and got to see the twins for the first time Friday night. Jack was so excited he pooped. So to recap, we had 5 people (my mom, myself, Shae, my dad, and Dorothy), 2 babies, 2 dogs, and a cat all staying under the same roof. Fun times. After getting some rest Friday night (or as much as two hungry babies who slept all day would let us), Saturday we headed out to Lockwood for “Baby Shower North”. The last baby shower I had to survive involved a house full of ladies playing baby games while I tried to hide out in the office with LB. This shower involved BBQ, beer, bows (and arrows), and of course LB. The babies made an appearance too. The 3 B’s were great, but my favorite part of the day was all the people who wanted to hold/feed/change the babies. After almost 7 weeks with the babies we were more than happy to let everyone else take care of the babies all day while we enjoyed some time off. The other highlight: the gifts. Holy Crap! We got tons of stuff. Clothes, books, toys, diapers, and all kinds of other goodies. Quite a haul for the babies. Thanks to everyone for the presents; I’m sure the babies love them. Shae and I haven’t been able to go to the movies for quite a while. For the last month or two of her pregnancy Shae didn’t want to do anything that involved leaving the house, much less anything that didn’t involve bathroom breaks every 20 minutes or so. Obviously, it’s not any easier to get to the movies now (or maybe not so obviously based on the number of people who think it’s OK to take babies to movies…but that’s not us).Well , Sunday we were able to exploit my mom’s love of her grandchildren to pawn them off on her and get out of the house long enough to catch a movie. Shae loves teen movies and vampires so “we” decided to go see a vampire love story aimed at 13-year-old girls: Twilight. It doesn’t matter what the movie was, it was just nice to get out of the house and throw down some popcorn. After a few days in KC and Lockwood, it was Thanksgiving day. As has become our tradition, we spent turkey day at the Fosters’. My mom, my dad, and Dorothy joined Shae, myself, the babies, and Shae’s parents out in Lockwood for Thanksgiving. We also had plenty of dogs: Lunchbox, Ty (Shae’s parents’ dog), Kuge, and Bertha & Brandy (my dad and Dorothy’s boxers). Quite a crew. Every year we try to get a picture of the Thanksgiving crew (including the dogs) after dinner. Last year we ate late and by the time we got around to trying to take the picture it was getting dark. Mr. Box (seven-months-old at the time) didn’t help matters by running all over the place throwing up dust and getting Kuge and Ty all riled up. Here’s what we ended up with. This year we decided it might be best to take the picture before dinner while there was still plenty of light. Lunchbox may be a year older, but he still wasn’t very cooperative at picture time. We finally got him to stop playing in the dirt long enough to get our picture, so it was time for some turkey. As always, the food was great. We stuffed ourselves full of turkey, stuffing, potatoes, and everything else. The babies skipped the turkey and had some formula. They didn’t get any pie either, but everyone else got plenty. After dinner, it was time for our annual Thanksgiving evening walk. This is where the giant stroller really came in handy. It may be huge, heavy, and a pain to strap to the roof, but it sure is nice when you need to do some off-road walking after dinner. The thing took everything we threw at it: dirt, rocks, big piles of sticks, etc., and the babies just napped through the whole thing. That’s about it for the babies’ first Thanksgiving. It was a good time, and they were very well behaved. They even watched a few episodes of the Thanksgiving weekend “Cool Tools” marathon on DIY (the Do-It-Yourself network) with Grandpa Foster. I think Jack wants a new wheelbarrow for Christmas and Ella wants a new screwdriver. Saturday we loaded up the car to head back home, but of course there was a twist. We could barely fit all of our stuff in the car for the trip North, there was no way we were going to fit our gifts in the car for the trip home without a little help. That’s right, it was time to strap the top carrier to the roof of the Mazda. As a kid, I always hated cruising in the back seat of my dad’s station wagon with the dogs in the back and the top carrier strapped to the roof. So of course there I was with two kids in the backseat, Lunchbox in the back, and the top carrier looking super cool on the roof. Good thing my dad had an extra one to help us out. I thought the trip up was long, but the trip home was even worse. Apparently everyone else thought it was a good idea to head home on Saturday to beat the rush too. The babies fall asleep instantly as soon as the car is moving, but they don’t do so well in stop-and-go traffic. So there we were stuck in LA traffic with both babies screaming for two hours. That was fun. Nine hours and two eardrums after we left Lockwood we eventually made it home, got the car unloaded and finally relaxed for a few minutes before bed. The baby shower and Thanksgiving were great, but it’s always nice to be home.